Is this the Apple product that will reinvent TV? "Apple TV will reinvent the way that you watch television, and this is just the beginning," Apple CEO Tim Cook promised on-stage at a product event last week. So what's next? Perhaps a bundle of broadcast and cable channels that are sold through iTunes and streamed to Apple TV boxes or iPhones. A number of companies are already working on selling "virtual cable" -- channel packages that don't require a visit from a cable guy. These streaming services don't blow up the cable bundle, but they make it more convenient and portable, and in some cases smaller. Apple would be the biggest entrant to the market yet. The Wall Street Journal reported Monday night that Apple would like to launch such a service "this fall," and is in negotiations with major channel owners to make it happen. Apple (AAPL) would like "to price the service at about $30 to $40 a month," the Journal reported, attributing the figures to media executives. At that price point, the package would cost less than a typical American household's cable television subscription. But it would also include fewer channels -- it would be what people in the industry call a "slimmed-down bundle." Such a service might be marketed to households that have stopped subscribing to cable. But it would still require some form of broadband access. And therein lies the rub: companies that sell both TV and broadband, like Comcast, already offer significant discounts to households that sign up for both. Would an Apple bundle of TV channels plus a broadband connection from some other company really be much cheaper? And what's to stop broadband providers from hiking the cost of Internet access in order to make up for lost cable TV customers? Of course, when Apple pitches new products, it's typically more about innovation than about price. The as-yet-unnamed Apple service could include powerful on-demand viewing options, new ways to navigate the channel lineup and other features. None of the companies involved are commenting. And the plan could fizzle out, like Apple's previous attempts to sell TV channels have. But it's likely to move forward, partly because channel owners are increasingly open to new paths of distribution. Some big channel owners, like Time Warner (TWX), the parent of CNN and this web site, are already in business with the Dish Network's (DISH) version of "virtual cable," called Sling TV. Sony (SNE) is about to launch its own version, called Vue. Related: Would you sign up for "virtual cable?" Channel owners like Comcast (CCV) and CBS Corporation (CBSA) are also pursuing various new streaming products to supplement their existing channels. CBS, for instance, has a $6-a-month service with thousands of on-demand episodes. The big media companies are essentially placing lots of bets to reach customers -- some on traditional forms of distribution, some on new digital routes. Apple's service, like Dish's, would take a traditional cable channel bundle, adapt it, and get it to customers in a new digital way. Cook's pledge to "reinvent" TV -- something he's hinted at for years -- came on March 9 when HBO, which is owned by Time Warner, made a big announcement at Apple's press event for the Apple Watch. Starting next month, HBO will let households that have broadband, but don't have cable, sign up for its live and on-demand TV service through Apple TV. 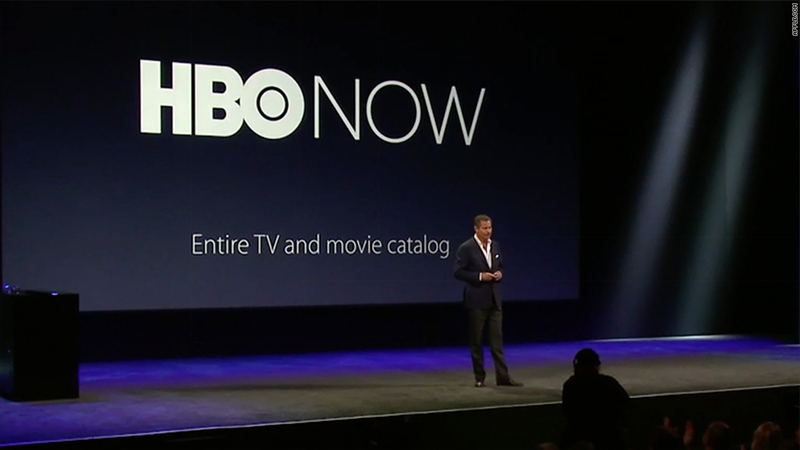 Until now, HBO has only been available through cable. Maybe the very definition of the word "cable" is about to change.